Thank you all for your thoughts and concern for my amazing husband. He is a fighter. We have been having a rocky road filled with new curve balls everyday, but I know that through prayers and faith, we will make it through this trial soon. My husband LOVES Dip. He is always asking me to make him something he can dip some chips or bread into. Seriously, what that man craves is a good Cheeseball. My mom and I created this recipe with him in mind. We actually made it a couple weeks ago before all this craziness started to happen, but I thought it would be the perfect time to share in tribute to him.One of the MANY sweet comments for my readers said that I should create a recipe in tribute to my husband involving the things he likes. I LOVED that idea. This is probably the first of many you will find that are inspired by my husband. **UPDATE** You can read my husband’s journey with Guillain Barre Syndrome here. Again, thank you all for the prayers our direction. Luckily, we have a miraculous story to share. There are so many ways you could serve this. You could cut a baguette in slices spread on top and bake, cut a loaf of french bread in half, spread it on and bake, use it as a dip, or a fun idea is to slightly hollow out a loaf of baguette bread and stuff the center with the dip and then slice. I love how many variations you can do with this! Give it a try! The flavor is absolutely wonderful! Mix all ingredients together and serve as desired. You could cut a baguette in slices spread on top and bake, cut a loaf of french bread in half, spread it on and bake, use it as a dip, or a fun idea is to slightly hollow out a loaf of baguette bread and stuff the center with the dip and then slice. I continue to keep your family in my thoughts and prayers.I hope that he comes home soon so you can make him some of this delicious looking/sounding dip! This looks yummy! You're in my thoughts and prayers for your husband's speedy recovery. Yum! This sounds delicious! 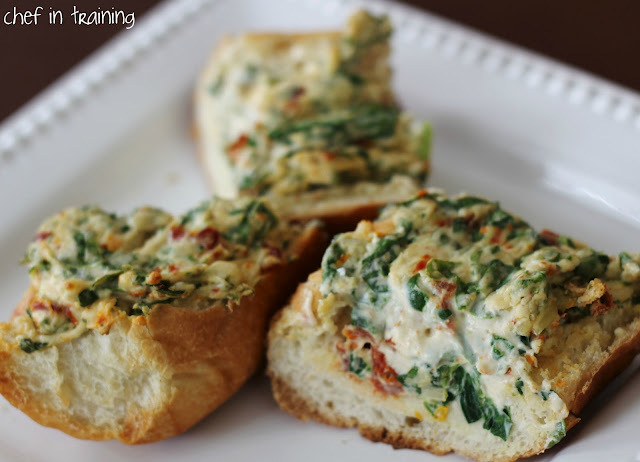 I love the idea of creating & sharing tribute recipes for your husband. He and your family will continue to be in my thoughts and prayers. Can't wait to try this recipe. I am sure it will be a big hit at our house! We are praying for your husband and all of you.. I've been following your blog for a while now and I love it! I told all my sister-in-laws, mom, and sister about it and they follow you as well! I know exactly what your husband is going through because I had Guillain Barre' Syndrome myself and you are doing the best thing possible for him by just being there. It helps by having a patient and supporting family...keep up the awesome tribute recipes! Prayers for your husband and family. 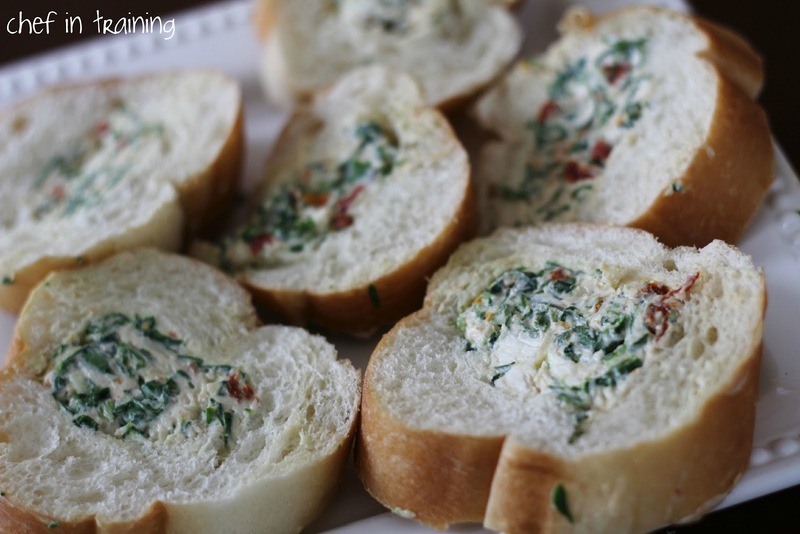 Any dip with spinach would be fine by me, but you also include one of my favorite "vegetables" - sundried tomatoes! Don't know why I hadn't thought of this before. Nicely done! 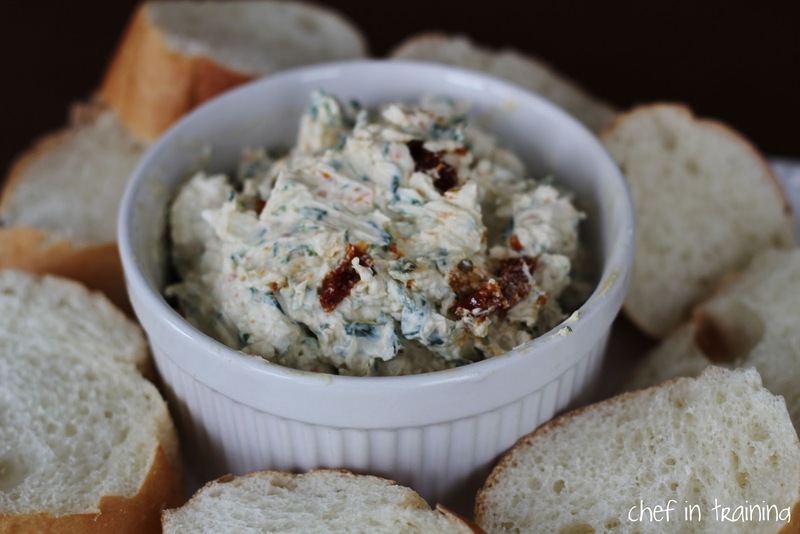 this dip looks insanely good Nikki! Love the idea of baking it right into the bread. i bet serving it in a bread bowl would be amazing too! that looks absolutely delicious. completely made my mouth water!thanks for sharing. I hope that whatever your hubby is going through, is not long before he recovers. Sending prayers your way. This is so good! I made it as a dip for my daughter's first birthday party. I added more garlic because my family does that to everything. Thanks for the recipe! I made this for a party and it was a hit! The only problem was that it is so thick people couldn't dip the slices of french bread in, they had to use a little knife and smear it on. Any suggestions on how to thin it out so it can be used as a dip rather than a spread? I'm a HUGE fan of sundried tomatoes, and this wee beauty is definitely on my list of things to make again, so thank you! You may want to mix in a little mayo, that usally allows the creamy texture to remain but will thin it out enough to be a dip. This looks SO GOOD! I am having a get-together with some friends on Saturday and was looking around for some ideas for appetizer-ey type things to have out, and this looks great! I love anything with sun dried tomato! Thank you! If I wanted to bake the dip inside the hollowed loaf, what temp and time would you suggest? It looks great. I made a variation of this with greek yogurt instead of cream cheese for those who wanted a dip and it turned out delicious!! I just made this for the Super Bowl and it's delish! I cut up the sundried tomato very fine at the husband's request and baked it for about 25-30 minutes and served with crackers and toasted Seeduction bread from Whole Foods and we're loving it! I'm new to your site and love it. I also send well wishes to you and your family. Hope you have a wonderful 2013!! This looks awesome Nikki! Praying for your family!